Once when attending a career-building seminar aimed at broadcast journalists, the guest speaker, who’d had years of experience in this industry, issued a specific word of caution to us up-and-comers about our resume tapes. Those are the tapes we desperately send out to news directors in markets higher than the one in which we currently work, hoping something in the first ten seconds doesn’t induce a gag reflex and prompt the tape to be yanked out. We call them tapes, but nowadays, it’s a dvd. Covering the president, while an extreme honor, merely means that you passed the security clearance at the federal level to get a press credential. You survived the world’s biggest hurry-up-and-wait drill. And you and your crew managed to not screw up your feed, or botch your audio, as you collected the key moments of the event (the entrance, the standing ovation, the exit) usually from a platform WAYYY in the back of the room. Not to sound cynical, but that’s really what it amounts to be. Tomorrow, President Obama comes to town. The last time he was here, he drew some 72-75,000 people to the bowl in Waterfront Park. It was, by all acccounts, an historic day. 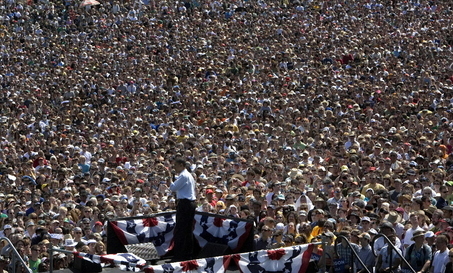 It caught the attention of the national media, it was the largest gathering of his 2008 campaign, and by golly, it kinda put Portland on the map. The Oregonian newspaper has the A1 page proudly displayed in its newsroom. Given the context of how much has happened since he took office, I enjoy the context of having the Big Man step on our turf. I appreciate the weight of the news event. And I love that he’s here because we have a hotly-contested gubernatorial campaign, which can only serve to energize the electorate. I know. That sounds kind of wonky-wonk…but it’s true. The reporter in me would rather be on scene, but hey, the anchor clip might look good on a resume tape, no?